The Collections are now divided in User Collections and Device Collections. It’s now not possible anymore to have users and computers in one Collection. It will always be an User Collection OR a Device Collection. The standard Collections are now limited till, All User Groups, All Users, All Users and User Groups, All Desktop and Server Clients, All Mobile Devices, All Systems and All Unknown Computers. Both, the All Users and User Groups –and the All Systems –Collections, are not editable. These Collections are used as the base for all of the other Collections. There are NO Sub-Collections anymore. Instead there are some new feature to fill that ‘gap’. The main reasons for Sub-Collections where organization and phased deployments. To organize Collections there is now the option to create Folders and for phased deployments there is now the option to Include another Collection (more on that later in this post). Another minor change can be found in the Home tab (same menu as a right-click) of a Collection. Most options are known from ConfigMgr 2007, except for the option Manage Affinity Requests. 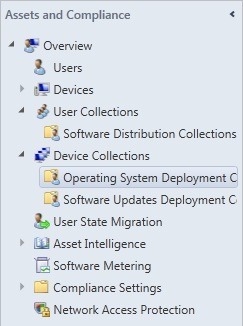 This is part of the new feature of ConfigMgr 2012, to set Primary Users to Devices and vice versa. It is also possible for user to set a Primary Device and that action will end-up as an Affinity Request. In the General tab, except for the two Collections mentioned before, all Collections have to be limited to another Collection. In the Membership Rules tab, are two extra Rule Types. There is now the option to Include and Exclude other Collections. This can be extremely helpful with phased software deployments. 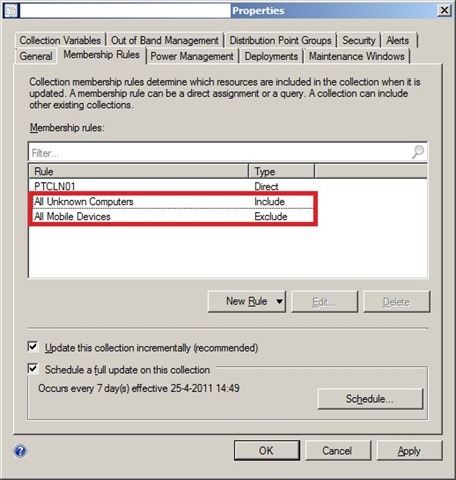 The Power Management tab, the Maintenance Windows tab, the Out of Band Management tab and the Collection Variables tab are now part the Properties of a Collection, instead of the Modify Collection Settings. The possible settings here have not been changed. In the Deployments tab, there is a detailed overview of all the assigned Deployments. With Software Updates even all the separate Software Updates, from every assigned Deployment, are shown. Deployments are previously known as Advertisements. The Distribution Groups tab is new. In this tab a Distribution Group can be assigned to a Collection. This will make sure that every assigned content will be automatically sent to all Distribution Points from the Group. In the Security tab it is possible to assign permission groups to the Collection. This is not new, but the Role Based Security behind it, is. 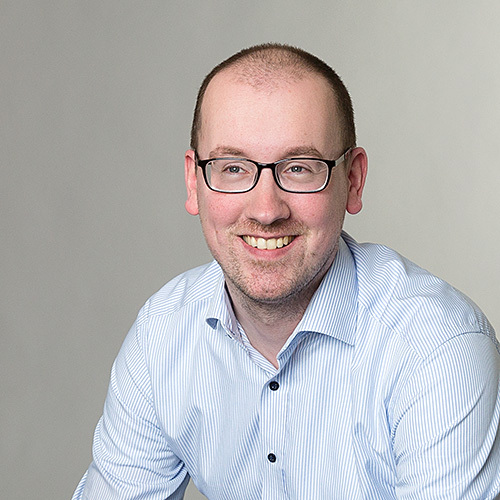 It makes it really easy to give certain groups limited access to parts of ConfigMgr 2012. The Alerts tab is new. This tab makes it possible to set thresholds for the Client Health and Activity in this Collection. The last notable changes can be found with selecting a Collection. On the bottom of the screen there are three new tabs. The first tab, Summary gives a summary of the standard information of the Collection. The second tab, Deployments shows all the Deployments for the Collection and the third tab, Assignments shows all the Assignments for the Collection. This can be Custom Device Settings, Compliance Settings, etc.